From the Department of Human Genetics (B.N., Q.S.P. ), Graduate School of Public Health, University of Pittsburgh; Department of Medical Sciences (E.G., A.B. ), University of Torino, Italy; Department of Radiology (R.R. ), Uppsala University, Sweden; Department of Medical Genetics (A.L. ), British Columbia Children's Hospital, Vancouver, Canada; Department of Genome Sciences (M. Spielmann), University of Washington, Seattle; Department of Pediatrics (M.K.K., R.A., M.K. ), McGovern Medical School, University of Texas, Houston; Departments of Clinical Genomics and Neurology (R.G. ), Mayo Clinic, Rochester, MN; Department of Pathology (M.A. ), King Abdulaziz University, Jeddah, Saudi Arabia; Department of Medical Imaging (M. Sharma), Western University, London, Canada; Departments of Pathology and Clinical Neurological Sciences (R.H.), Western University and London Health Sciences Centre, Canada; Office of the Clinical Director (W.A.G., C.T. ), NHGRI; and NIH Undiagnosed Diseases Program (W.A.G., C.T. ), Office of the Director, NIH, Bethesda, MD. Objective Clinical, radiologic, and molecular analysis of patients with genomic deletions upstream of the LMNB1 gene. Methods Detailed neurologic, MRI examinations, custom array comparative genomic hybridization (aCGH) analysis, and expression analysis were performed in patients at different clinical centers. All procedures were approved by institutional review boards of the respective institutions. Results Five patients from 3 independent families presented at ages ranging from 32 to 52 years with neurologic symptoms that included progressive hypophonia, upper and lower limb weakness and spasticity, and cerebellar dysfunction and MRIs characterized by widespread white matter alterations. Patients had unique nonrecurrent deletions upstream of the LMNB1, varying in size from 250 kb to 670 kb. Deletion junctions were embedded in repetitive elements. Expression analysis revealed increased LMNB1 expression in patient cells. Conclusions Our findings confirmed the association between LMNB1 upstream deletions and leukodystrophy previously reported in a single family, expanding the phenotypic and molecular description of this condition. Although clinical and radiologic features overlapped with those of autosomal dominant leukodystrophy because of LMNB1 duplications, patients with deletions upstream of LMNB1 had an earlier age at symptom onset, lacked early dysautonomia, and appeared to have lesser involvement of the cerebellum and sparing of the spinal cord diameter on MRI. aCGH analysis defined a smaller minimal critical region required for disease causation and revealed that deletions occur at repetitive DNA genomic elements. Search for LMNB1 structural variants (duplications and upstream deletions) should be an integral part of the investigation of patients with autosomal dominant adult-onset leukodystrophy. We have previously shown that ADLD is caused by a duplication of the lamin B1 gene (LMNB1, chr5q23.2), resulting in increased LMNB1 protein expression.4,5 Although only LMNB1 duplications have been definitively shown to cause ADLD, we recently identified a genomic deletion upstream of the LMNB1 gene in a single large pedigree (ADLD-1-TO) that resulted in an phenotype similar to ADLD caused by LMNB1 duplications.6 As the mutation was identified in only a single family, it was difficult to unequivocally confirm the link between the LMNB1-associated deletions and the leukodystrophy phenotype. In this report, we present the analysis of 3 novel families with genomic deletions of varying sizes upstream of the LMNB1. The identification of a larger cohort of patients allows us to confirm the association between LMNB1 upstream deletions and disease, define a broader phenotypic spectrum associated with the mutation, and acquire mechanistic insights into the cause of this genomic rearrangement. Clinical and radiologic evaluations took place under the guidelines of the respective institutional review boards, and all patients provided written informed consent. All data used in this study are included in this report or accompanying supplementary information. Clinical characteristics of the 5 patients are described in table 1 and e-supplementary clinical information (links.lww.com/NXG/A135). The age at onset of neurologic symptoms ranged from 32 to 52 years. Presenting symptoms included dysarthria and hypophonia (4/5), poor dexterity (4/5), imbalance (3/5), weakness of the extremities, including asymmetrical weakness (3/5), tremor (2/5), and painful leg spasms (1). Of note, early involvement of the autonomic nervous system was notable in only 1 patient with orthostatic intolerance and urinary urgency. In 2 patients, urinary urgency and incontinence were late features of the disorder, occurring only after development of severe lower limb spasticity. Two patients indicated significant propensity for worsening of symptoms in relation to elevated environmental heat and humidity. Four patients underwent brain MRI (figure 1); all had a corticospinal tract involvement extending from the upper frontal lobes to the cerebral peduncles. Three patients (DEL1-1, DEL2-1, and DEL3-1) had extensive symmetrical white matter hyperintensities in all cerebral lobes with a less affected periventricular rim on T2-weighted spin-echo images. Patient DEL3-2 was unique, as she did not exhibit extensive lobar involvement compared with other patients. Of interest, the central parts of the pathologic areas in this patient showed a low signal intensity (SI) on T2-weighted fluid-attenuated inversion recovery images indicating high fluid content. The upper cervical spinal cord was seen in the sagittal brain images. The anteroposterior diameters at C II were below the normal range in all patients. MRI of the cervical and upper thoracic spine, obtained in DEL3-1 and DEL2-1, did not reveal atrophy at the lower levels, nor obvious SI alterations. All images are T2-weighted. (A) Patient DEL1-1 had the most extensive changes. Very high SI in the frontal, parietal, occipital, and temporal white matter and even juxtacortical areas were pathologic (A.a–A.d). The periventricular area was less affected on SE images (A.a, A.b, arrows) but exhibited a very high signal on FLAIR images. The entire posterior limb of the internal capsule was pathologic (A.c, arrowhead). The corticospinal tract (open arrow) had a high SI also in the cerebral crura (A.d), pons (A.e), and pyramids of the medulla oblongata (A.f). High SI in the decussation of the superior cerebellar peduncles (A.d, open arrowhead) and in the middle cerebellar peduncles was observed (A.e, star). The splenium was thin and revealed a high T2 signal (not shown). Patients (B) DEL2-1 and (C) DEL3-1 have less extensive changes in lobar white matter (B.a–B.e, C.a–C.e). The periventricular area was less affected both in the SE and FLAIR images (B.a and B.b, C.a and C.b, arrows). High SI continued in the corticospinal tract (open arrows) in the internal capsule (B.c and C.c) and the cerebral crura in the mesencephalon (B.d and C.d). Diffusely increased SI was also present in the upper pons (B.e and C.e). Decussations of the superior cerebellar peduncles (B.d and C.d, open arrowhead) had a high SI (B.d and C.d, open arrow). Patient DEL2-1 had larger mesencephalic SI changes (B.d) compared with the other patients. This patient also had cerebral atrophy: very broad third ventricle (B.c), widened lateral ventricles (B.b), and cerebral sulci (B.a–B.e). (D) Patient DEL 3-2 had abnormalities distinct from other patients; the SI was very high locally in the posterior frontal lobes, including corticospinal tracts, on the SE images (D.a and D.b). On the FLAIR images, the central parts of the pathologic areas showed a low SI as a sign of a high fluid content. There were some small separate frontal and parietal lesions that may be of the same or another etiology, whereas very small occipital changes (D.c) were present. The high SI continued downward in the corticospinal tract (D.c and D.d, open arrows) until the cerebral crura but not further. Increased SI in the decussation of the superior cerebellar peduncles was observed (D.d, open arrowhead). FLAIR = fluid-attenuated inversion recovery; SE = conventional or turbo spin-echo sequence; SI = signal intensity. Schematic diagram of the deletions upstream of the LMNB1 gene in the 3 reported families. Also shown is the deletion from the previously reported family (ADLD-1-TO) from Giorgio et al. (2015). A comparison between the genomic regions deleted in the different families allowed us to identify the minimal critical region required for the disease phenotype. Note that the critical region spans a 2 putative TADs (TD1 and TD2), and a deletion would result in the disruption of the TAD boundary (TDB). Putative forebrain enhancers are also indicated. TADs were characterized using the 3D Genome Browser (promoter.bx.psu.edu/hi-c/) on fetal brain-derived data. ADLD = autosomal dominant leukodystrophy; TAD = topologically associated domain. Patients with deletions upstream of the LMNB1 gene had clinical and radiologic signs that exhibited both unique findings and partial overlap with ADLD due to LMNB1 duplications. Clinically, 4/5 patients presented at onset with speech symptoms including dysarthria and hypophonia. This has not been reported for ADLD with LMNB1 duplications, where the most common presenting feature was autonomic dysfunction. Onset of symptoms also appeared to be earlier in patients with deletions. Analysis of the deletion events, which were clearly nonrecurrent, allowed us to define a minimal critical region of ∼167 kb that is required for disease causation. Strikingly, this genomic region encompassed a boundary between 2 topologically associated domains (TADs) and strengthens our original hypothesis that a disruption of the TAD boundary causes LMNB1 overexpression and in turn the disease.6 Sequencing the deletion junctions revealed the importance of repetitive elements (Alu, LINEs) in the genomic rearrangement. Their presence suggests that either a nonallelic homologous recombination mechanism or a microhomology-mediated break-induced repair type mechanism mediated by repeats is likely to cause the genomic deletions. The identification of a larger cohort of patients confirms the pathogenic role of deletions upstream of LMNB1 in the leukodystrophy phenotype. Given that these mutations do not alter the coding sequence, our data also emphasize the importance of regulatory elements and the need for performing analyses for copy number variants that might be missed with the standard whole-exome sequencing, currently being used to identify mutations in patients with leukodystrophies. C. Toro, A. Brusco, and Q.S. Padiath managed the project. A. Lehman, M.K. Koenig, R. Adejumo, M. Knight, R. Gavrilova, M. Alturkustani, M. Sharma, R. Hammond, W.A. Gahl, and C. Toro performed clinical and radiologic examinations. C. Toro and R. Raininko analyzed and complied clinical and radiologic data. B. Nmezi and E. Giorgio performed aCGH experiments. B. Nmezi, E. Giorgio, M. Spielmann, A. Brusco, and Q.S. Padiath performed analysis of aCGH and genetic data. B. Nmezi, E. Giorgio, R. Raininko, C. Toro, A. Brusco, and Q.S. Padiath wrote the manuscript with inputs from all authors. This work was supported by funds from the University of Pittsburgh to B.N., Q.S.P., the Fondazione Umberto Veronesi (postdoctoral fellowship 2017 to E.G. ), the “Associazione E. E. Rulfo per la ricerca biomedica” to AB, and the National Institutes of Health (NIH) Common Fund through the NIH Undiagnosed Diseases Program/Undiagnosed Diseases Network. B. Nmezi reports no disclosures. E. Giorgio holds patents for 3 siRNA sequences targeting a single allele of the human LaminB1 gene as therapeutic option for Autosomal Dominant Leukodystrophy. R. Raininko reports no disclosures. A. Lehman has received governmental research support from the Canadian Institutes for Health Research; has received academic research support from the Department of Medical Genetics at the University of British Columbia; and has received foundation/society research support from the Rare Disease Foundation and the British Columbia Clinical Genomics Network. M. Spielmann reports no disclosures. M.K. Koenig has served on the scientific advisory board of Novartis Pharmaceuticals; has received travel or speaker funding from Novartis Pharmaceuticals and Lundbeck; serves on the editorial board of the Journal of Child Neurology; holds a pending patent for a topical product for treatment of facial angiofibromas in Tuberous Sclerosis Complex; has served on speakers' bureaus of Novartis Pharmaceuticals and Lundbeck; has received commercial research support from Novartis Pharmaceuticals, Reata Pharmaceuticals, EryDel S.p.A., Vtesse, Inc, Pfizer, Retrophin, Stealth, and Ultragenyx Pharmaceutical; has received governmental research support from the NIH and the Department of Defense; has received foundation/society research support from People Against Leigh's Syndrome; and has received license fee payments from LAM Therapeutics. R. Adejumo has received commercial research support from Ultragenyx Pharmaceutical, Inc., EryDel S.p.A., Stealth BioTherapeutics, Inc, BioElectron Technology Corporation, and Retrophin, Inc; has received academic research support from the University of Texas Mitochondrial Center of Excellence; and has received foundation/society research support from People Against Leigh's Syndrome. M. Knight reports no disclosures. R. Gavrilova has served on the scientific advisory board of the Mitochondrial Medicine Society Board. Murad Alturkustani reports no disclosures. M. Sharma serves on the editorial board of the Canadian Journal of Neurological Sciences. Robert Hammond reports no disclosures. W.A. Gahl has received travel funding from the Cystinosis Research Network; serves on the editorial board of Molecular Genetics and Metabolism; receives ManNAc licensing royalties; and has received governmental research funding from the NIH. C. Toro is an employee of the NIH. A. Brusco has served on the editorial boards of Frontiers in Aging Neuroscience and Frontiers in Neurology; holds patents for a new method for SCA1-3,6,7 genetic diagnosis and for allele-specific antisense therapy for ADLD; has received academic research support from the University of Torino; and has received foundation/society research support from Associazione Emma ed Ernesto Rulfo. Q.S. Padiath reports no disclosures. Full disclosure form information provided by the authors is available with the full text of this article at Neurology.org/NG. The authors thank the patients for their participation. They also thank Dr. Svetlana Yatsenko, the Pittsburgh Cytogenetics Laboratory, and other members of the Padiath laboratory for technical assistance and helpful discussions. Accepted in final form November 6, 2018.
. Autosomal dominant leukodystrophy caused by lamin B1 duplications a clinical and molecular case study of altered nuclear function and disease. Methods Cell Biol 2010;98:337–357.
. LMNB1-related autosomal-dominant leukodystrophy: clinical and radiological course. Ann Neurol 2015;78:412–425.
. Autosomal dominant leukodystrophy with autonomic disease. In: Pagon RA, Adam MP, Ardinger HH, et al., editors. GeneReviews(R). Seattle, WA: University of Washington; 1993.
. Analysis of LMNB1 duplications in autosomal dominant leukodystrophy provides insights into duplication mechanisms and allele-specific expression. Hum Mutat 2013;34:1160–1171.
. Lamin B1 duplications cause autosomal dominant leukodystrophy. Nat Genet 2006;38:1114–1123.
. A large genomic deletion leads to enhancer adoption by the lamin B1 gene: a second path to autosomal dominant adult-onset demyelinating leukodystrophy (ADLD). Hum Mol Genet 2015;24:3143–3154.
. Adult-onset leukodystrophy: review of 3 clinicopathologic phenotypes and a proposed classification. 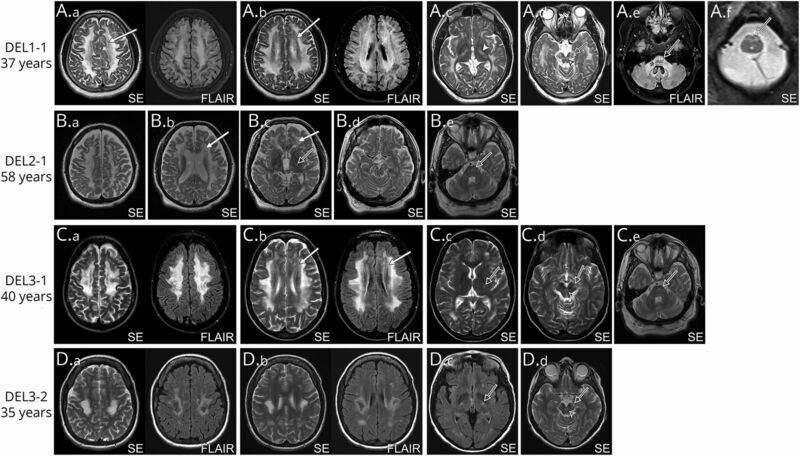 J Neuropathol Exp Neurol 2013;72:1090–1103.
. MRI and CT in an autosomal-dominant, adult-onset leukodystrophy. Neuroradiology 1997;39:423–426.